A couple of years ago, we raved about the B.M.C. Audio CS2 integrated amplifier, for a number of good reasons. Like the CD player/transport, DAC, and power amps – and supposedly like the phono stage – we liked the B.M.C ethos and its products because it all represents some of the truest aspects of high-end audio as it used to mean; high performance, significant build quality, and something ‘reassuringly expensive’ without being utterly financially unattainable. But this year, the CS2 received some useful upgrades and became the CS3. How could we resist the chance of a revisit? Like its predecessor, the CS3 is a cleverly configurable amplifier that can be used as an integrated amplifier, or the power amp in a pre-power system. Part of the reason it can so readily be swapped from one to the other is that it’s in essence a power amplifier with what B.M.C. calls its Discrete Intelligent Gain Management system and a source selector. Usually, integrated amplifiers are a cross between a preamp and a power amplifier in one chassis. Used with a suitably equipped DAC, the whole gain structure of the amplifier is modified on the fly to suit the volume level set by the converter. This is different from signal attenuation, it’s more like changing the size of the amplifier relative to the volume level. Discrete Intelligent Gain Management circuit moves the gain control out of the input and effectively controls the level of the output stage (thereby reducing input attenuation and excessive noise and distortion from additional amplifier stages). Of course, a ‘suitably equipped DAC’ is one of B.M.C.s own and this therefore relies fully on B.M.C.’s own system architecture. 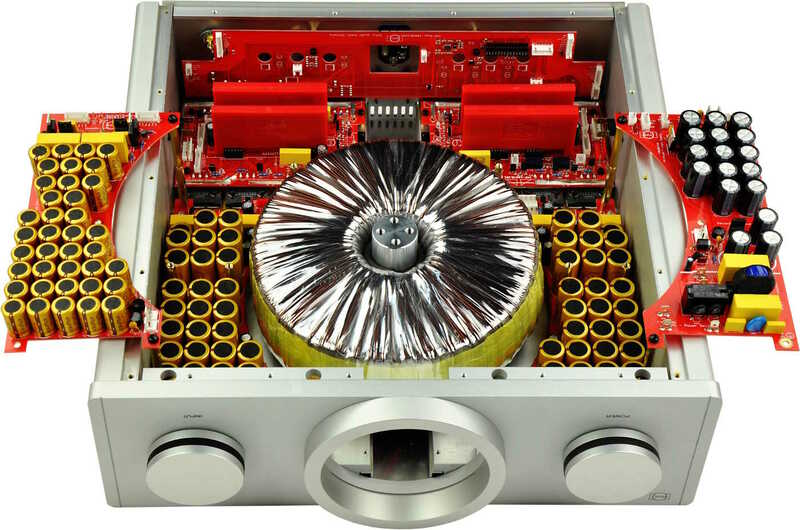 Without that we are just looking at a very heavy integrated amplifier, albeit one that retains that DIGM circuit as part of its internal make-up. From memory, the effect was more marked when used in harness with a whole B.M.C. system, but equally from memory CS3 seems to be a bit more volume-precise than CS2. In outright, absolute terms, there’s not a great deal of difference between the CS3 and CS2 it replaces. They deliver identical specifications, have indentical inputs and outputs, and even the dimensions of the amplifiers are basically the same. The change is down to a revised circuit designed to increase stability and make the sound of the CS3 even less compressed and more dynamic than before. In theory there is an upgrade path between CS2 and CS3, but unless you were using them in mono amp mode, with a CS2 on one channel and a CS3 on the other, I would struggle to think why you should make the jump. Especially as that would mean loading that 40kg amplifier back into its box. In today’s Class D, slimline world, this is a beast. Behind the big front panel, large white blue VU meters and huge volume and control knobs is an amplifier built for the big game. Open the amp up (not an easy task, it’s all vents and fins rather than a simple top-plate) and you are met with an exercise in transformer and capacitor use. This has not changed. It’s not simply a heavy chassis; it’s rooted in place thanks to massive power reserves. Any amplifier with 2kW of toroidal transformer in the power supply is very likely going to be strong and stable… and not in the ‘Theresa May’s mantra’ sense! However, it’s not simply a big amplifier. Instead, this uses B.M.C.’s own LEF (Load Effect Free) design. This uses a very small single-ended Class-A output stage with a low-impedance voltage output. This stage, as well as the gain stages, has no feedback loop whatsoever. An independent circuit, not attached to the music signal, measures the current inside the voltage stage and keeps it constant by supplying an external phase independent current. Combined with a floating voltage cascade, the voltage stage hardly moves on its non-linear curve and thus doesn’t produce any THD. Uniquely, this is actually avoiding THD instead of correcting it by an overall loop. Partner this to its Current Injection system (which replaces the gain stages by a special I/V converter that maintains a low impedance through to the loudspeaker output voltage, thereby preserving the original current of the signal source through the CS3) and – especially when used with other B.M.C. electronics – it’s pretty clear this is not just another 200W amplifier. Like its predecessor, the amp has just three RCA single-ended inputs and two XLR balanced, as well as the Toslink-cabled opto control system, which allows B.M.C.s own DAC1 to take over preamplifier duties if called upon. There’s not much in the way of control, either; the big knobs turn the amp on and alter the volume, while the two buttons run through the inputs and dim that big white blue display. The display has both power meters and a zero-66 volume level in 1dB steps (although using the conventional ‘more is louder’ relative scale than the counter intuitive dB scale), and the relevant input is indicated along the top of the dial. Forget balance, tape loops or tone controls – this is old school purist high-end, and arguably all the better for it. Given the weight, the huge warning on the box telling users not to rest the amplifier on its knobs, or store it fascia down, is probably wise. As is finding at least a couple of strong people to lift it out of the box.